I was so enthralled when I saw these watermelon pops from Tidy Mom! So easy, but so cute! I knew immediately that I had to convert them from fruit to cookie. I simply made up some sugar cookie dough, grabbed my "candy corn" cookie cutter from Copper Gifts and went to town. Be sure to insert the sticks before baking! When eating watermelon (which I love), I prefer seedless (best invention ever), but for a cookie it must have seeds to kick up the cuteness factor! To top off the royal icing, I used the seeds that I had on hand~dark chocolate covered pomegranate seeds from Trader Joe's:) Unlike watermelon seeds, they're tasty and you'll want to eat them by the handful. Place the seeds on the icing while it is still wet. The two-tone decorated rind idea was taken from the talented Glorious Treats' darling watermelon cookies. Glory decorated them to perfection! I used a green AmeriColor Gourmet Writer to achieve the dark green contrast. For the red, I used AmeriColor Super Red soft gel paste. With it, you will get a true red! Thanks for the great suggestion, Bridget! Besides beautiful cookies, Bridget's blog, Bake at 350 is full of great ideas! As I've said before, it's such a pleasure to "know" so many creative bloggers and benefit from their ideas and talents! Oh those are so cute! I wish I could make cookies like that! But I wouldn't know where to begin! How wonderful .....love it !!! How adorable... love the bright colors! I so need to try decorating sugar cookies. It's the one thing that makes me a little nervous. You are amazing!! So cute!! You have the most creative cookie ideas of anyone I know! These are just adorable. So fun for summer. Love that you gave shout outs to everyone that share their ideas. So cute Sue! I love the seeds. Have a great week! Oh my gosh, Sue! Another totally cute cookie I love these! So bright and summery! So darling for summer. You have the cutest ideas, Sue! Thanks for your supportive comment last week. These cookies are so much fun! Are these sugar cookies a crunchier version so they stay on the stick better? Sue, these are perfect, I love that you added stripes to the green part of them. So adorable. I LOVE these, they are adorable!!! These are absolutely adorable! And I am soo impressed by your perfect icing! A great idea for summer birthdays or picnics! Thanks! You make the most beautiful cookies. Oh my, oh so cute! adorable! great job and great photos! Oh! These are so cute! I'd love for you to stop by for my Friday Favorites party! this makes me hungry, lol :) very nice! Good heavens! These cookies are sooooo cute! These are adorable. You are very creative. These are just so adorable, but I wouldn't expect anything less from you! Love how cute they are. 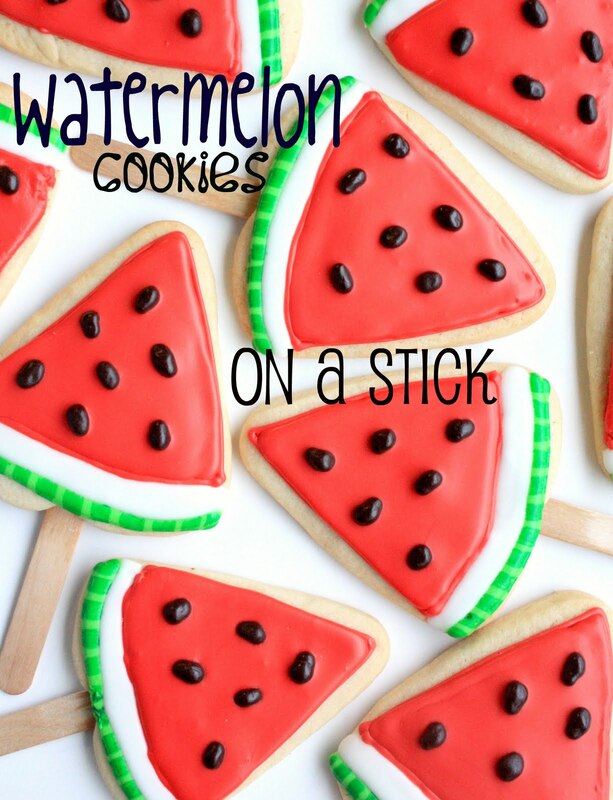 Watermelon is so good, but these watermelon cookies are even better! Amazing idea! It's great, I love those cookies. I put a link on my french blog to your article.